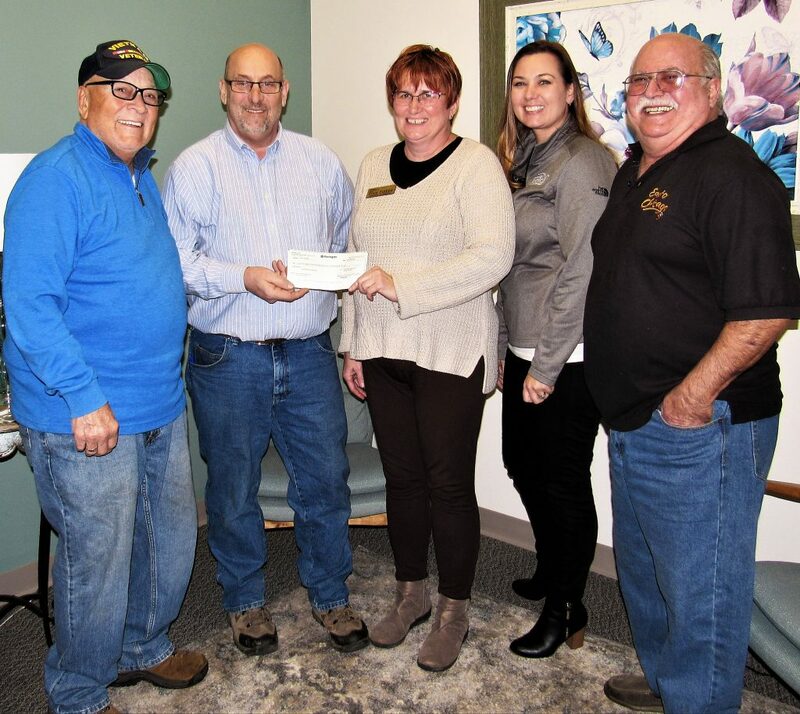 SALEM — The Salem Club had more than $1,100 left over from the veterans poker run it held in 2017 and wanted to make a charitable contribution. Randy Agee, president of the club located at 542 S. Broadway Ave., said it donates a minimum of $2,500 each year to charity. On Monday, Agee, along with two other club members, Francis Goetz and Augie Thomas, both U.S. Navy veterans, met with Heather Kane, volunteer coordinator for Community Hospice at 2341 E. State St., B, and Pixie Furbee, the Veterans Services Coordinator for Community Hospice, and delivered a check for $1,172. Community Hospice serves Columbiana, Carroll, Stark, Tuscarawas and surrounding counties with “peace, hope and compassion” and has a census of about 260-265 people. It also participates in a “We Honor Veterans,” a national awareness program that focuses on strengthening partnerships and networking with other veteran organizations. Holding level three status in the program, its activities include ongoing veteran-focused education provided to its staff and volunteers to help understand unique end-of-life issues that veterans face. During the referral/admission process a military checklist is completed to identify veterans entering Community Hospice, which also partners medical centers and service organizations to assure veterans access to all the benefits available. Veterans are also recognized with pinning and remembrance ceremonies which provide the opportunity to acknowledge the military service and sacrifices made by veterans and their families. Veterans are given pins, flags and certificates and to date more than 500 veterans have been honored at pinning and remembrance ceremonies. “It’s the mission,” Furbee said, “our team has quite a reputation” adding that not every hospice frames the certificate. There are 25 volunteers “that deal with veterans, that do the pinnings,” she said. Community Hospice also is currently raising money to develop a permanent veterans memorial in a reflective area outside of the Community Hospice House in New Philadelphia to honor patients who bravely served America. In Columbiana County, the hospice interfaces with 45-50 people on a regular basis.